For over 30 years C.S. Flournoy has helped homeowners in Lakeside and the surrounding East Virginia area with all their tree removal and care needs. We offer comprehensive service that includes Tree removal, tree feeding, trimming, bush hog mowing, stump grinding and stump removal. We have built a reputation as a company that you can trust for fast efficient service, work of superb quality, and affordable rates that stay within your budget. We are committed to providing you with the highest level of customer satisfaction anywhere in the industry. Don't settle for less for your home's landscape when you can get the very best with C.S. Flournoy. One of the benefits of partnering with C.S. Flournoy for your lawn care is that you get comprehensive service from one company that does it all. When you contact us, we can send a specialist out to your property in order to take an on-site assessment of the current condition of your entire landscape. We can identify critical issues that may be keeping your trees and shrubs from growing as they should. We ca also make recommendations on what additions may be needs to fully enhance your yard and help your home to stand out. In addition to our distinguished tree service we also go deeper with land clearing and land grading. Whether you're purchasing new property and want a clean slate or you're tired of that old growth that clutters your yard, we can give your landscape a fresh new start. We clear out all dead trees and growth and unattractive greenery, trim out overgrown trees and thin out thick shrubs and bushes. We can also grade your yard in order to eliminate flooding, erosion, and uneven areas. When the job is done you'll be able to design your yard exactly how you want it. Do you own a sizable field or a large piece of land that you can't seem to tame? We offer bush hog mowing that can clear out all the high weeds and growth from your land. We use advanced mowing equipment that gives your property a clean look and keeps it looking great through the spring and summer months. This service involves specialty mowing equipment to cut away tall grass and brush from fields and other overgrown areas. So whether you need to clear a path for a large plot of residential property or have commercial space in need of clearing, C.S. Flournoy can handle it for you. 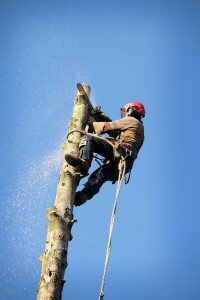 If you are looking for a Richmond Tree Removal Company then please call C.S. Flournoy Inc., today at 804-264-1000, or fill out our online request form.